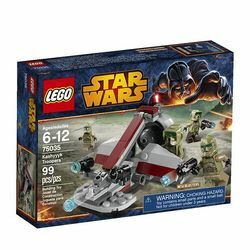 75035 Kashyyyk Troopers is a Star Wars battle pack released in 2014. It includes 2 Kashyyyk Clone Troopers and 2 41st Elite Corps Troopers and the third rendition of the Republic Swamp Speeder. The Swamp Speeder is built upon transparent smooth dome pieces, allowing it to slide along a flat surface. It features mainly grey dark grey and dark red pieces. The back features a fan, which can swivel left and right, and clipped onto the top of the fan is a beam, which runs down the centre of the vehicle diagonally down to the lower front section. At the end of this beam in the front area is a clip on either side, which can each hold Clone Trooper's firing blaster, meaning they can act as the speeder's blaster cannons. To either side of the fan is a black seat, and in front of the seats are grey and dark red armoured areas, which can be rotated up and down. The set also includes a total of four minifigures- two 41st Elite Corps Troopers and two Kashyyyk Clone Troopers, all of them armed with firing blasters, which are new to the wave this set was released in. It also includes a total of ten transparent blue studs for the guns to fire. The Infantry Support Platform (ISP), otherwise known as the Swamp Speeder or Republic Swamp Speeder, was a repulsorlift speeder used by the Grand Army of the Republic for swamp combat and recon. The craft utilized a large, rear turbofan, working with the craft's repulsorlifts, to navigate through the dense swamp landscape. The fan acted as both the accelerator and brake. The speeder was piloted by two Clone Troopers, one on either side, who also controlled the dual forward-mounted blaster cannons. These blaster cannons were generally protective against infantry or small vehicles. It was said to be a heavy variant of the BARC Speeder. The craft was developed towards the end of the Clone Wars and used heavily in some notable battles including the Battle of Kashyyyk. This is a description taken from LEGO.com. Please do not modify it. (visit this item's product page) Ready the 41st Elite Troopers for battle on planet Kashyyyk! Facts about "75035 Kashyyyk Troopers"